Time for us to sit down with a cup of Joe and update each other. I was sad yesterday to find out that all the pictures I took weren’t on my camera at all. Somehow they never got saved to the memory card. I had some great ones of bigfoot, pasties, Lake Superior, flowers, and so much more. It so breaks my heart. I took them so I could blog about stuff and then to find they were gone, well. I thought I could recreate them in paint by drawing what they looked like. I am working on stories just at the moment we have a ton of clients to massage! Been at work some weeks seven days. This week I took 2 days off and my schedule is slowly filling to full. I stay longer at the spa to see if anyone calls in for that last-minute massage. Never know when a body is in need. As I sit and wait, I have been crocheting and writing as the day allows or if a spark of something happens in my head. I have been taking pictures as I walk around Munising while waiting for people to call in. I run off for some lunch somewhere usually Johnny Dogs. If you are in Munising, I would so suggest Johnny Dogs! One thing about Johnny Dogs, they are packed so plan on a long line! My other favorite spot in Munising is the Falling Rock Cafe. A fellow Nancy owns this cafe. She has a ton of books for you to read, live entertainment some days/nights, and they make amazing sandwiches. If you are craving pizza, go to Pictured Rocks Pizza. Pizza is cooked in about 8 minutes and at a great price. The bread sticks are amazing as well. I eat pasties at Muldoon’s. I am not sure where else pasties are sold in town, but this is the place everyone goes to for pasties. I always get a traditional beef pasty. We do have a new coffee shop in Munising. It is called Fudge and Coffee. I love Tuesdays for the farmer’s market at Lake Superior. Right by the water and several vendors with great food they have grown or they made as in soap, lotion, bread, cookies. I had pictures of that as well. So sad. While you are down there, get a pizza from the ladies at the pavilion. It is five dollars for a cheese only and the proceeds go to different charities like the girls softball team. They always have a sign up to where money is being donated for that day. It is a blessing to see you again. Let’s have coffee another day and catch up on all things going on in our lives. Until the next time we meet, may your day be blessed with coffee prosperity! I should have written this yesterday but alas, I got busy and just didn’t do it. I am still selling crocheted animals and dolls if anyone wants one. On with the gossip of McDonald’s located at 503 North Lincoln Road in Escanaba, Michigan! Everyone has rumors but I asked the workers changing McDonald’s and the staff of McDonald’s, what the hell is going on? I was there twice before and well, I am a nosy person, so I have known since around the middle of February that the playland was going bye-bye. I got to hear the Wilson’s talking to the architect about the designs and I got to see the designs the day before they took out playland. Now most will tell you it is coming out because of maintenance and insurance or liability. Just not so. Our McDonald’s has decided to follow the corporate rebranding of McDonald’s. This is the reason. Nothing to do with extra seating or playland but with the corporation itself. The new “modern” McDonald’s is trying to compete with Starbucks! Therefore, all the franchises are expected to follow corporate’s lead and ideas. They are squaring up the outside of the building and remodeling the whole inside. They will have the lobby closed for about 1 day but no one knows exactly when. THAT IS RIGHT FOLKS THE WHOLE STORE IS GETTING A FACELIFT! The lobby is getting more plugs and the new design. If you have been to Green Bay’s McDonald’s then you will know what it should look like. They are leaving in the corner booths but expect all chairs and tables. McDonald’s Corporation has been rolling out new designs like the ordering menus inside the lobby which means you don’t have a cashier, having someone bring your meal to the table, and being more of a coffee shop with WiFi access. McDonald’s is fading itself from the image of fast food and families to being a coffee shop that serves food giving people access to the internet. I talked to the kids that came in and they all hate the new McDonald’s. They want their play area back. They no longer want anything to do with this place. What is most upsetting is that the play equipment went into the garbage. Everyone believes it should have been donated to a place, any place, where kids can still use it. Several parents have said they won’t be coming back and that includes grandparents as well. It was the sole reason to be at our local McDonald’s. It was the place to go with small children. It kept them wore out and on good behavior since they could play a while and eat. Even the elderly where asking the staff of McDonald’s where the kids were going to go now. We have really bad winters. This means finding an indoor place for the children to play. There is now a huge, HUGE gap in our town that needs replacing. It is nice that corporate wants to compete with Starbucks but at what cost. They are now alienating the families who really were the backbone of McDonald’s. McDonald’s would never have served millions of people with out the children begging to go there. I have some more pictures for you all and when the remodel is complete, I will get you more. I am not sure what to think of McDonald’s new way of being. I guess we all grow up at some point in time. McDonald’s has been sued over and over again because of the menu maybe they think it is time to say goodbye to the food and hello to the coffee driven society of people. I just wanted you all to know it has nothing to do with liability, insurance, or maintenance of playland but in the new rebranding of the McDonald’s image. I will write you all again real soon. Until then, enjoy your coffee and net surfing at a McDonald’s near you! A little Nothing about Sunday! Good MORNING to you all! Sorry I haven’t been getting those words onto the blog in a while. I know you are all waiting for the next Miss Nose story and I have been busy with other activities. Being involved means I can’t express myself or learn new and exciting words adding to my vocabulary. But I did learn a new one recently! I love to write or crochet in my down time. It all depends upon my hands and if they are hurting after working on everyone. Massage is not an easy career path. If you don’t take care of yourself, kiss your career good bye. Carpal tunnel is the major reason most end their massage career as is back issues and tenosynovitis. This is because massage schools only give you 500 hours of training and don’t teach proper body mechanics. They don’t teach students the proper exercises to strengthen their body nor do they teach students to use heat and ice after their day. I am very lucky. I went through a program that took 2 years of my life but I learned massage therapy the correct way. They taught us proper body mechanics, how to treat injuries, and how to limit ourselves so we could have a very long career. I am forever grateful to them and the City of Colorado Springs for demanding such a course. I digress. Time to the real reason I am typing this blog post. I learned something new recently. As you all know, my friend Alice’s cat Smokey needed surgery for cancer. She still needs funds to help pay for the vet costs, Smokey’s meds, and other items like changing the bandages. He is learning to walk on 3 legs. He is sore. Poor kitty is fighting for his life. I have been crocheting in my off hours to try and raise money to send to Alice for Smokey. In the U.P., it appears everyone crochets or knits and no one wants to buy what you have created. Washcloths, blankets, hats, mittens, slippers, and scarfs. I created a ton of each and no one wanted them. I ended up giving them away to relatives. But this just made me more determined to look into something that no one is creating here and I realized what it was, it isn’t baby items either, it is amigurumi! That is right. My new word now placed in my vocabulary is amigurumi! What is amigurumi? I actually stumbled upon it when I was looking for slipper patterns. The slippers I make are in an amigurumi style. Amigurumi’s definition is the Japanese art of knitting or crocheting small, stuffed animals, creatures, or dolls! It got this reference from several dictionaries and books I read in the library. One book I read, and I forgot the name of it, said they are dolls with oversized heads. After reading the books, I headed to the internet and saw several pieces of others work. Amazing. My first chicken didn’t come out right. I am still trying to figure it out. But by looking at them, I realized they were balls. I have accidentally made balls when trying to make hats! Then there is the idea of trying to clone what others have done for beaks, feet, ears, eyes, and such. Not easy. I saw one person’s blog on a rabbit, her suggestion safety eyes. Safety eyes are for dolls which makes sense. I tried to crochet eyes on him and they didn’t turn out right at all. My first attempt at creating a chicken didn’t turn out like I had hoped. I think I need to get to some you tube videos and see if they can help me make the small parts. If I find one that is really good at making these small parts, I will share that person in a future blog! I didn’t have doll eyes so I tried my hand at crocheting the eyes on. My chicken is a bit funky and slightly scary. A bit deformed too. I think I used too large of a hook since he came out the size of my coffee cup. The chicken ended up bigger than I thought. Since this is the one type of item I am not seeing people create here in the U.P., I decided I may have a great chance of now getting some money to help Smokey. 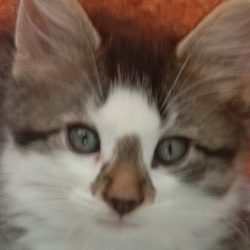 I have another friend as well, she runs a rescue and sure could use help in feeding those cats. I am still trapping ferals in Cornell so they can get spade and neutered. Nothing worse than having babies to worry about when you are homeless. the backside of my chicken. Maybe this should have been the front. Let me know what you think! I think I found something I really enjoy. I will bring you more amigurumi blogs as I create them! Hi, I am here for morning coffee! Will you be my friend? BOO! See I told you he is scary! It is New Year’s Eve and this will be the last post for 2016. I know this year has had its ups and downs. We have lost people this year like every year. We have had some hard times and let go of stuff we loved but have gotten new stuff to love more. I am sure you have tons of stories about this year. I wanted to give you a run down on our stories. I am working on two Miss Nose Evil Joe Files stories. I have a Miss Nose story that is turning into a novel. Really, it is getting long. It is longer than the 2000 words I usually write for Miss Nose stories. I have two other stories I am working on as well that are still in their infancy. Mainly I have the story map done on them with some of the story actually written out. They are developing. I am still working on my Ackerman Lake Murders and have thought about rewriting them a bit making Ackerman Lake a town outside of Munising. 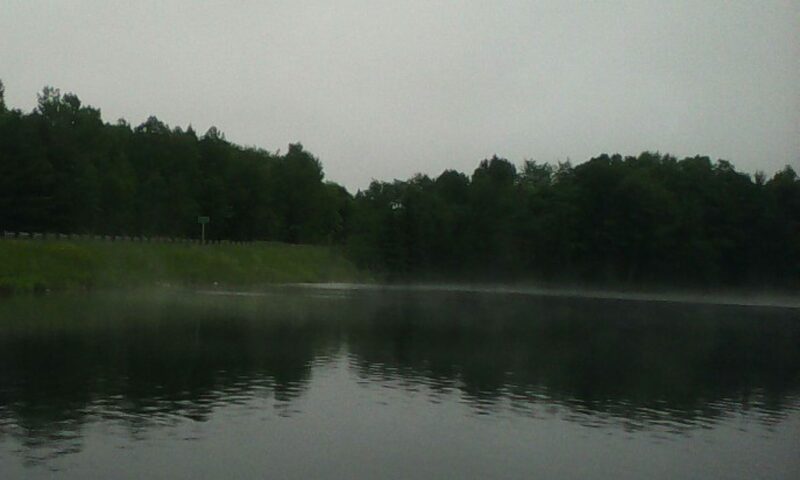 It is really just a lake with houses around it and is located outside of Munising. It is near Au Train at least near the road you turn on to get to Au Train. I am working on the Stalking of Katie still as well for the #shapingyourstory. I really am trying to make my writing much better and more enjoyable. I have been working on my very first blog that used to be on blogger but I moved it here to wordpress. I have been doing chanting challenges on there and writing up some reiki articles. I am writing some stories on massage, muscles, and injuries which I am thinking about placing on that blog. I have been reading books in my spare time and I have some that I really need to write reviews on and get on this blog. When you are doing laundry as a massage therapist, you need something to help pass the time and reading is mine. I even read when I am waiting in between clients. I read at lunch instead of being on my phone or computer. It gives my hands a break since writing, typing, and massage really takes a toll on them. I am thinking about a year in review blog, but what is there to review? If you have something you really like about 2016’s posts, let me know and I can make a special best of the year from the readers! I hope your new year is great and abundant. From Miss Nose and myself, HAPPY NEW YEAR! We welcome 2017 we great expectations. Maybe this year Miss Nose will find the man of her dreams! It is pouring outside here. I am writing and watching Ancient Aliens. I hope your Sunday is blessed and you are well. I figured I should start doing something to both my blogs daily. I am thinking and writing which leads to forgetting to keep this site going or my KWP Money Reiki going. I need to make some new abundance checks and get some new cat photos for that site. I need to work on some more massage and reiki articles for it. So much writing to do and so little time to think where should it go. I want to put more thought in my writing but I have to remember to update as much as possible both blogs. Life can be rough if you allow it. Just need to focus more. Tata for now! Happy Caturday! A Nothing Note! It has been a month since I posted anything. I really should start posting daily even if it is some goofy picture so you can keep coming back. I sit here with my coffee filled with french vanilla creamer taking a break from writing two Miss Nose stories and a possible creepy pasta for October. I have also been working on my Ackerman Lake Murders and I am thinking about changing it completely. I am baking up Oatmeal Cranberry Cookies. Joe loves them. They are healthy, I know, but that is good for the parrots. They can’t have some of the stuff I do. It does another thing as well, stops cravings for unhealthy cookies. lol. I have been going to people’s houses for massage. It isn’t the same as having an office but it does make it nicer for the client. I am looking at finding some new modalities to add for my mobile business. I am looking for a drivable RV to turn into a mobile office. School has started and I haven’t had a day home. It has been doctors and other running. Been so crazy. Both my girls came down with the common cold and guess who they gave it to, ME! So I have been battling that. We had to pick up my oldest daughter’s violin from Jim’s today. The neck had separated from the body and it cost us $60 to fix. She is so happy that it is back. All I have been hearing since we came home is her playing. Happy Autumn Equinox to everyone. It is fall and harvesting time. All the farmers around me and I have been getting ready for winter. Canning, picking, cleaning barns & coops, & putting stuff inside so it isn’t left outside during this time. Mitch, a local farmer, who lives on St. Nicholas Road, is selling vegetables he has grown to anyone wanting them. If you are interested, give him a call. He has tomatoes for .75 cents a pound. Can’t beet that! Get it beet instead of beat! lol. Farm humor.